The Nevada Legislature is the state legislature of Nevada. The Legislature is divided into two, consisting of the lower house – the Nevada Assembly with 42 members, and the upper house – the Nevada Senate with 21 members. All 63 members of the Legislature are elected from an equal amount of constituent districts across the state. Members of the Assembly are elected to a two-year term with term limits of six terms. Members of the Senate are elected to a four-year term and have three term limits. The term limits mean that each Member of the Assembly is not eligible to serve any more than 12 years. At the following link you may search for your Assembly Member or State Senator by county or by inserting your physical address into the search bar on the top right of the page. You may also search for your Congressional representatives working in Washington, DC, as well. Sessions of the Legislature are biennial (every two years), occurring during odd number years. The Nevada Legislature is only one of six states that meet every other year. The Legislature begins work on the first Monday of February during the odd number of years and it ends its work at midnight Pacific Standard Time (PST) 120 calendar days after it started. Any legislative action taken after midnight PST on the 120th calendar day is null and void, unless the legislative action is conducted during a special session convened by the Governor of Nevada. 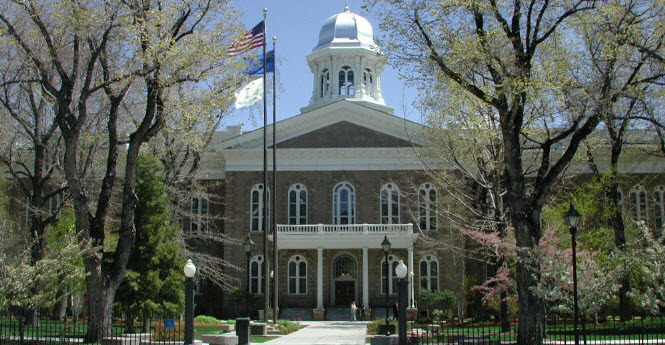 The Legislature meets in Carson City – the Capitol of Nevada.